The earliest known depiction of the stick-zither appears on a mural painting in one of the Buddhist caves of Ajanta (in the state of Maharashtra) and dates back to the end of the Gupta period (5th century A.D.). 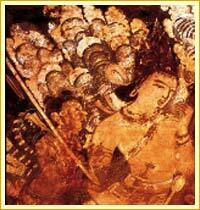 It shows Lord Indra with a celestial being on his right-hand side. In the palm of his right hand, the latter holds a long, slender stick, whose upper end rests on his right shoulder. A very flared resonator is fixed on top of the stick and the celestial being appears to be singing while plucking the single string of his instrument. Ajanta (cave 17), end of the 5th century A.D. This stick-zither may have been the vina that goes by the name of ghosaka in the Natya-shastra, the renowned treatise on dramatic arts that appeared towards the beginning of the Christian era. In this tome, the ghosaka is mentioned as a secondary instrument probably serving as a drone. 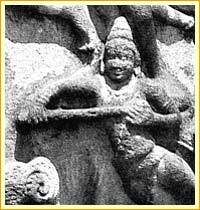 Celestial beings - half-man half-bird – are once again portrayed playing a similar instrument on a seventh-century rock carving in Mahabalipuram, a town on the Coramandal coast to the south of Madras (in Tamil Nadu). The stick no longer rests on the shoulder but is held across the body, with the hemispherical resonator pressed against the chest. This typical posture is found on a large number of sculptures of that period, especially in the southern parts of the peninsula. All the iconographic evidence confirms that it remained a one-stringed instrument of a rudimentary design, with just a resonator made of gourd or coconut shell fixed on to the stick or the tube with vegetable fibres. A similar instrument called tuila was played till recent times in Orissa. During this period, Lord Shiva was often depicted playing - or holding in his hands – one of these initial kinds of vina which, like the hourglass-shaped drum damaru, were held to be one of his divine attributes. 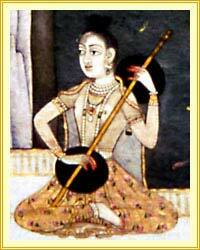 Here, the playing posture is practically identical to the one seen on the rock carving in Mahabalipuram. The extremely flared resonator (reminiscent of the one in Ajanta) is held against the chest with the palm of the left hand. The dimensions and mode of construction as well as the sophisticated playing technique on this stick-zither, termed alapini, are discussed at length in several medieval-Indian musicological treatises. 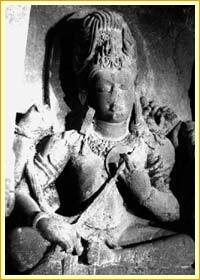 Shiva, Ellora (cave 16), 8th century A.D.
One-stringed vina became very popular towards the end of the first millennium and many Arab scholars made note of them during their travels in India during the 10th century.